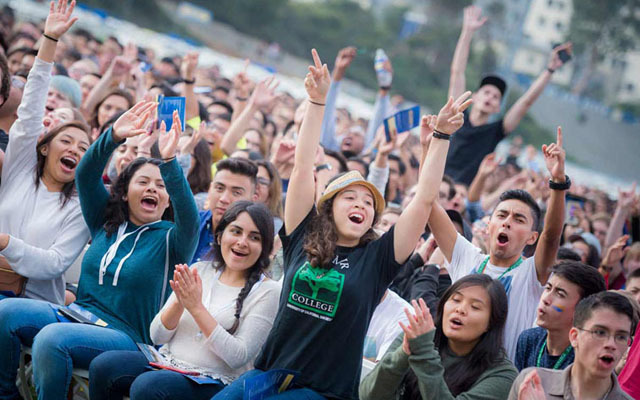 UC San Diego will join the Changemaker Campus Network—a dynamic, global network of students, staff, administrators, faculty and community partners who share inspiration, connections and a desire to broaden the reach and impact of social innovation around the world. The recognition is the outcome of an extensive three-year selection process. Ashoka U is an initiative of Ashoka, the world’s largest network of social entrepreneurs. The organization recognizes colleges and universities globally that have embedded social innovation as a core value. According to Ashoka U officials, students need interdisciplinary, entrepreneurial and solutions-oriented skillsets to succeed in today’s world that changes at a quickening pace. In all, 72 percent of current higher education students say that having a job “where I can make a difference” is very important and 65 percent expect to make a social or environmental impact through their work, according to a 2012 Net Impact study conducted by Rutgers University and supported by the MacArthur Foundation. UC San Diego students have the opportunity to affect change through a number of co-curricular community service programs and the campus’s 600 registered student organizations—more than 90 of which have a primary focus on service. On average, nearly 20,000 UC San Diego students complete more than 3 million hours of changemaking community service each year. UC San Diego has been repeatedly recognized as a top college by the Peace Corps and has been included in the President’s Community Service Honor Roll year after year. The campus also has been named the top public university in Washington Monthly’s rankings of universities contributing to the public good for six consecutive years. In addition, UC San Diego also sends a large cohort of students to the Clinton Global Initiative University (CGI U) every year, where thousands of students, university representatives, experts and celebrities come together to discuss and develop innovative solutions to pressing global challenges. UC San Diego hosted CGI U in 2011. UC San Diego’s classes and programs also offer students many opportunities to be social innovators. For example, the campus’s Global TIES program, offered by the Jacobs School of Engineering, empowers undergraduates from all majors to work on ambitious projects with nonprofit organizations and non-governmental organizations throughout the world. Students are currently working with NGO partners in the Philippines and Fiji. And they are developing projects right here at home, including at the Birch Aquarium and across the border in Tijuana, where students are developing software to improve communications between ambulance drivers and dispatchers. Students work under the guidance of faculty members at the Jacobs School. In addition, UC San Diego is home to the Center for Social Innovation and Impact (CSII), which combines rigorous business thinking and entrepreneurial spirit to address the big issues and challenges that face society. The center, housed at the campus’s Rady School of Management, works closely with faculty, graduate students, schools, divisions and student organizations across the UC San Diego campus and collaborates with community partners locally and across around the globe – embracing the belief that strong, interdisciplinary collaboration enhances the impact made on pressing social issues. As part of the recognition, UC San Diego has plans to create opportunities to enhance and highlight UC San Diego’s transformative contributions to social innovation. The campus-wide effort will amplify the impact of individual programs and initiatives through strategic communication and collaboration. Building on the network’s vision for a world where everyone is a changemaker, Ashoka U takes an institutional change approach to impact the education of millions of students. The organization works with colleges and universities to break down barriers to institutional change and foster a campus-wide culture of social innovation.